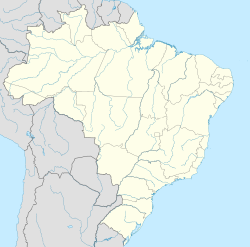 Campo Belo (Portuguese for "bonnie field") is a ceety locatit in Minas Gerais state, in Brazil. The estimatit population in 2006 wis 52.631 indwallers an the tot aurie o the municipality wis 526,753 km². It wis foondit in 1879. Campo Belo's climate can be classifee'd as tropical altitude, wi yearly average temperatur o 23.5 °C. The Köppen climate clessification o the region is Cwa (Tropical on heich altitudes, humid/wairm simmer an a dry/ceul winter). Wikimedia Commons haes media relatit tae Campo Belo.